RainKhan is a Team PokerStars member. Hevad Khan has made himself famous on the poker scene by his vibrant personality. Far from being shy, he is always noticeable and noticed wherever he sits. Sometimes so noticeable that they had to change the rules at the WSOP. What an achievement! He was first noticed in 2006 when he was accused of using poker bots to play on his behalf at pokerstars. The suspiction of many of his opponents was aroused because someone or something was using his account to play more than 25 sit and go tables at the same time. They reported him to the pokertars security team, as robots are considered to be unfair competition to human players. They are strictly prohibited at PokerStars. It turns out that it was himself playing all along. As a matter of making the facts straight, he invited a journalist in his room and he was filmed played 33 sit and go tournaments simultaneously. This cleaned up his reputation and made him an overnight star, as almost noone else can play simultaneously (and profitably) that many tables at PokerStars or at any online poker room. RainKhan has always been interested in games. Before poker he was a gamer. He started to be a StarCraft professional at age 13. This is how he got his nickname, as "Rain" is a fictional character from "Mortal Kombat". RainKhan later learned poker and became so passionate about it that he dropped from SUNY Albany to become a professional poker player. He cloisoned himself for months just playing sit'n go tournaments before the 2007 WSOP. This was a good preparation for the WSOP and he finished 6th at the main event in 2007. 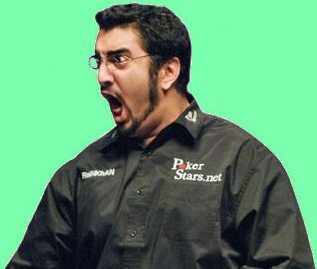 But some of his tactics were frowned upon and a new rule was implemented for the 2008 WSOP, the so-called "Hevad Khan Rule", which prohibits outrageous boisterous celebrations after a hand with a big profit. RainKhan continues his carreer as a tournament player, both live and online. Ironnically, he reconciled with his previous accuser PokerStars and is now a proud member of Team Pokerstars. Hevad had a huge victory recently as he won the 2008 Caesars Palace Classic in October for a prize of 1 million dollars. His total tournament winnings are in excess of $2.2 million. Use poker stars marketing code PSP8181 when you sign up at PokerStars, and you will get a 100% bonus up to $600. And you can even split your first deposit into three small deposits, and you still get the bonus if depositing within two months of registration.